The area that is now Slovakia was first unified first back in the 800's when the various Slavic tribes in the territory at the time came together in a Kingdom of Great Moravia. This, however, only lasted a couple of hundred years, as from around 1000, the Hungarians began to slowly annex territories that the Slovaks controlled, until by about 1100, it as all under Hungarian control. Slovakia remained part of Hungary for the next 900 years, even with the Ottoman Empire pushing into Europe. However, it is worth noting, that for a while, the capital city of Bratislava actually served as the capital for Hungary, rather than Buda. However, during 1848, the Habsburg Austro-Hungarian Empire was rocked by various rebellions, including the Slovaks, who took a horizontal tricolour of the pan-Slavic colours of red, white, and blue. The Slovak rebellion took a horizontal tricolour of white, blue, and red. After WWI, The Austro-Hungarian Empire's territories where divided up. Slovakia was unified with the territories of Moravia and Bohemia to form Czechoslovakia. The flag of which took a white and red bicolour, and defaced it with a blue triangle on the hoist. This flag, subsequently, has been taken as the flag of the Czech Republic. Before WWII, the Vienna Award handed Sudetenland to Germany, and then, during the war, Czechoslovakia was effectively carved up, with the Czech, or western part, swallowed by Germany, the southern territories of Slovakia handed to Hungary, and Poland gained a small piece. This left a rump Slovakia. 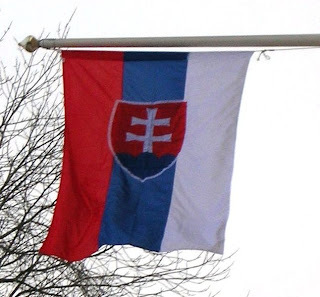 This pro-Nazi Slovakia opted to take the unofficial flag of Slovakia from within Czechoslovakia, the horizontal tricolour of white, blue and red. Its national coat of arms consisted of a white double cross, mounted on a blue mountain with three peaks, and on a red background. After the war, the territories of Eastern Europe where returned, largely, to their pre-war maps, with Slovakia being reintegrated with the rest of the Czechoslovak territories. With the Velvet Revolution, and Czechoslovakia's slow dissolution, Slovakia opted to bring back the tricolour once more as the flag of the Slovak republic, within Czechoslovakia. Throughout the very early 1990's, many groups debated the future of the Czechoslovak republic. Some people wanted a looser federation between the Czech, and Slovak republics. Others wanted to maintain Czechoslovakia, and keep the federation tighter. However, it was agreed that Czechoslovakia be dissolved in 1992. 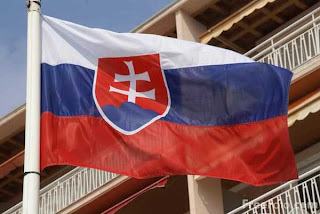 Upon Czechoslovakia's dissolution, the new Slovak constitution instituted the old Slovak tricolour, however, to differentiate it from Slovenia, and Russia, who all have similar flags, Slovakia defaced the flag with the national shield placed on the central blue stripe, towards the flags hoist. The shield is larger than the stripe itself. One of the rules for the flag governs how the flag is hung. The shield has to always be vertically, so for flags that are suspended vertically, the shield is rotated 90 degrees.